X Factor and BBC Radio 2 presenter Dermot O’Leary is heading to Broadstairs next month to promote his new childrens’ book. The star, who is married to Dee Koppang-O’Leary – the daughter of Broadstairs councillor Rosalind Binks – will be making his visit on December 9 for a BroadstairsLit event. 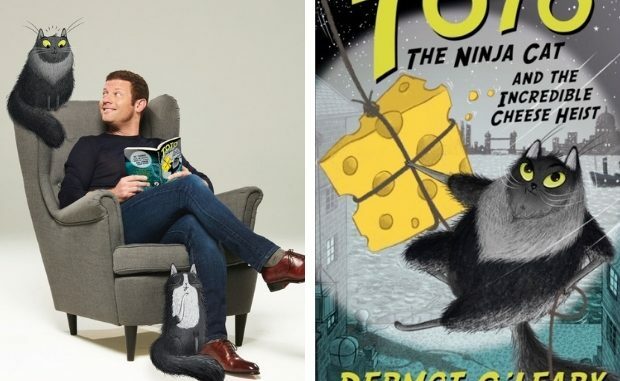 The book is based on Dermot’s real-life cats, Toto the Ninja Cat and the Incredible Cheese Heist is his second book in the Toto adventure series and sees the return of Toto and her brother Silver. By day Toto and Silver are ordinary cats, but by night, they find themselves having all kinds of adventures. The Stephen Fry-inspired character of Catface helps the kittens track down Britain’s missing cheese in order to avert an international cat-astrophe. Dermot said “I’m so glad to be doing this event in Broadstairs. I’ve been visiting Broadstairs for 16 years, so it feels like a second home to me. Dermot and book illustrator Nick East will be at the East Kent College campus for BroadstairsLit on Sunday 9 December from 3pm. They will chat about the book and Nick will lead everyone in a Toto draw-along. There will be a Q+A and a book signing afterwards. Waterstones will be there with both the Toto books available. Tickets must be pre-booked and will not be available on the door. House of Martin, 60 High Street, Broadstairs, (Weds to Sat 10:00 to 17:00 – cash only please).